The Dalesfolk of old lived Spartan lives in greystone farms and villages set in glacially-carved valleys between lofty moors and fells. Ella Pontefract, who wrote extensively about the dale-country, observed: “Of necessity the people intermarried and each valley became—what to a smaller extent it still is—like a large family”. Settlements and farmsteads were generally small, made of native stone, with flagged roofs. A complex pattern of walls fashioned of local stone was pieced together without a dab of mortar. Half a century and more ago, most Dalesfolk were native born, reared, educated and employed. Living conditions were crude. They dined largely on porridge and oatcake. Their economy was based partly on wool clipped from the backs of indigenous sheep. Milk from native cattle—the Shorthorn breed—was drunk or converted into butter and cheese. The meadows in the valleys were not the uniform green of today, when grass is conserved as silage, but rich in herbs and flowers and taken to the barns in the form of hay to provide winter feed for the stock. Fuel was gathered from peat pits. 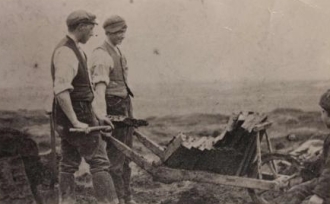 You can see a peat barrow being used at Keasden above. This is one of the images from the W.R. Mitchell Archive at The University of Bradford Special Collections. Profound changes to the life and landscape of the Yorkshire Dales have occurred. Today, a high proportion of the population are ‘offcomers’—men and women with an urban background who took the first opportunity, usually in retirement from work, to occupy greystone houses and cottages. Most of them are worthy folk who are profoundly interested in the old ways of life in the Yorkshire Dales country.